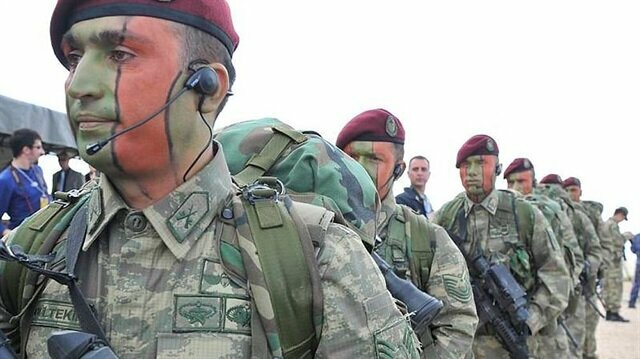 Maroon Berets, the special operation team of the Turkish military, have been deployed to Turkey's southeastern province of Hakkari on Tuesday to fight against the outlawed Kurdistan Workers' Party (PKK) terrorists. Reports said that the Special Forces units, known as "Bordo Bereliler" in Turkish, were deployed on Gerdan Tepe of Yeşilova village close to the Iraq border in Şemdinli District. The move came after a group of PKK terrorists opened fire on vehicles working for road construction in the area. Meanwhile, combat helicopters hit some pre-determined points used by PKK terrorists. It was unclear the whether the special forces engage direct action against the PKK so far. Turkish warplanes have hit the Kurdistan Workers' Party (PKK) terrorist targets in Northern Iraq's Qandil Mountain region, the main base of the PKK terrorists. The operation was conducted between 9 and 10 p.m. on Monday, September 26. As many as two PKK terrorist targets, with terrorists inside, were destroyed. The two targets were being used as ammunition storages and shelter by the terrorists. Separately, an explosives-laden truck left by two PKK terrorists was found in eastern Van province's Erciş district Tuesday, a security source said.The explosives were later disposed of safely in a rural area near the district. The two terrorists were also later caught, source added. Turkey has been intensively fighting against PKK terrorists both through land and air operations in southeastern Turkey and Northern Iraq since July 2015. Since that date, at least 600 security personnel have been martyred and about 7,000 PKK terrorists were killed. The operation was part of an ongoing mega operation against the PKK in Hakkari, that killed more than 300 terrorists in recent weeks. The PKK, listed as a terrorist organization by Turkey, the U.S. and EU, has been conducting armed conflict in southeastern Turkey for over three decades, killing more than 40,000 civilians. Turkey's military intensified operations against the terrorist group last summer, when the PKK broke the two-year-long cease-fire with Ankara. Since then, nearly 800 terrorists have been killed, and major cities have been cleaned from terror elements by security forces.